The Greek parliament approved a “humanitarian crisis” bill Wednesday, the first of a raft of social measures proposed by new Prime Minister Alexis Tsipras, despite stiff opposition from the European Commission, who called the law a “unilateral” action. The bill, which adopted housing allowances and emergency food aid for the poorest Greeks, was passed with support from conservative New Democracy lawmakers, as the government snubbed efforts by the European Commission to scupper it. "If they're doing it to frighten us, the answer is: we will not be frightened. The Greek government is determined to stick to the Feb. 20 agreement. However, we demand the same from our partners. 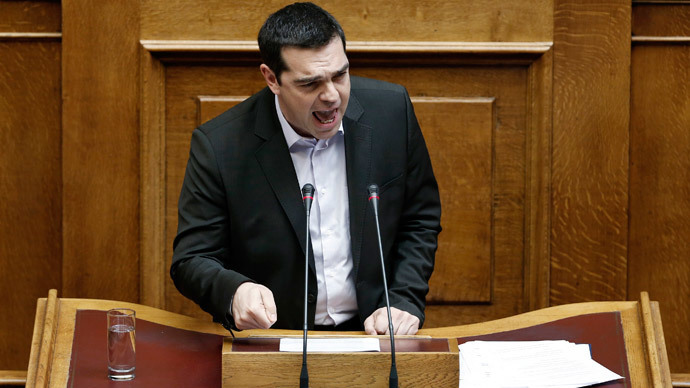 Let them stop unilateral actions, respecting the agreement they signed,” Tsipras told parliament. "What else can one say to those who have the audacity to say that dealing with a humanitarian crisis is a unilateral action?" he added. The bill also included a 100-installment payment scheme for taxpayers to settle their debts with the state, which was fingered by the commission as “fragmentary” action for solving Athens’ debt problems. In a correspondence between Costello and the Greek authorities, Costello argues that the bill is not compatible with the Eurogroup’s February 20 agreement with Athens, according to Paul Mason, a journalist who made the contents of the letter public Tuesday. Costello wrote that new laws adopted by Greece on finance must be included in the general context of reform promotion. “We would strongly urge having the proper policy consultations first, including consistency with reform efforts. There are several issues to be discussed and we need to do them as a coherent and comprehensive package. Doing otherwise would be proceeding unilaterally and in a piecemeal manner that is inconsistent with the commitments made, including to the Eurogroup as stated in the February 20 communiqué,” Costello reportedly told the Greek government. But Greek Finance Minister Yanis Varoufakis said the latest meeting with the Eurogroup included the bill. Although other government officials confirmed the existence of the text from Costello and said that certain points needed to be clarified. Gabriel Sakellaridis, a government spokesman, said the move by the European Commission amounted to a “veto” and was adding to the “pressure” on Greece which has debts of €240 billion. EU Economic Affairs Commissioner Pierre Moscovici denied there had been a veto of the bill. The 20 February agreement between Greece and the Eurogroup saw a compromise of sorts reached. Greece achieved an extension of its current debt repayment program until the end of June. For now a Greek exit from the euro was avoided, but the difficulty of reaching a deal raises the possibility that elections elsewhere in Europe in the coming months may see other countries such as Spain try and change the direction of economic reform in the eurozone. In spite of the February 20 deal, Greece risks running out of cash in a few weeks as the rift with its creditors widens. Athens and its international lenders began talks last week to try and agree details of reforms on the Greek side, but so far there has been little progress. French Finance Minister Michael Sapin said that people must rein back their language and do everything possible to stop Greece exiting the euro. "France will be do everything it can to avoid an accident and I believe that what we will do will avoid it. But no one can be categorical on this and this is why, on both sides, people must control their language," he told lawmakers.